John Stossel, journalist, author, and Central Park neighbor, tells the story of Balto, the sled dog whose heroic journey helped deliver diphtheria medicine to Alaska’s children in 1925. 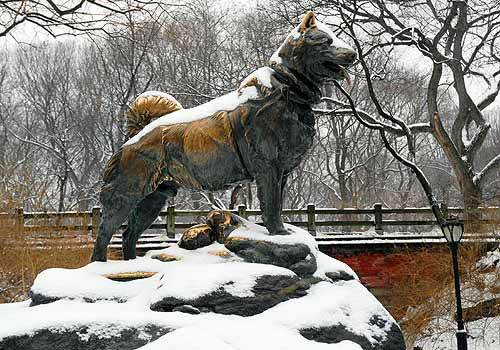 There are plenty of dogs to see in Central Park, but the Balto statue has been a favorite for almost a century. The piece pays homage to the famed sled dog who battled tundra conditions in Alaska and helped save the state’s children. In January 1925, a deadly diphtheria epidemic threatened the children of Nome. Medicine to stop the outbreak was in Anchorage, nearly a thousand miles away. Twenty sled dog teams relayed the medicine through blinding snow and temperatures that reached 40 degrees below zero. Balto, a hardy Siberian husky, led his team for the final 53 treacherous miles, arriving in Nome just 20 hours later. Newspapers and radio around the world followed the trek, fascinated by the brave team whose efforts eventually helped end the epidemic. Balto became an instant hero and media darling, and New Yorkers were quick to show their support. The bronze sculpture, created by Frederick G.R. Roth, was dedicated that same year on December 17.